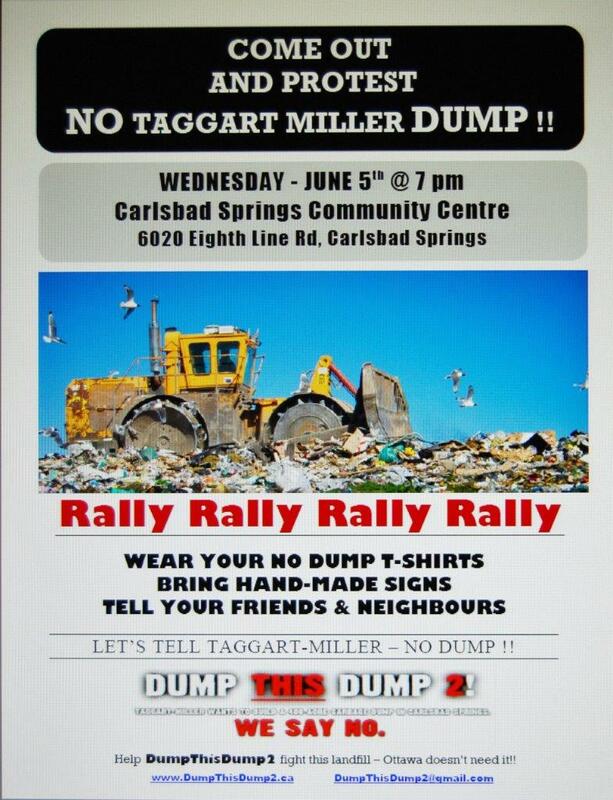 Come Out and Protest – No Taggart Miller Dump!! Dump the Dump Now is a group formed in Russell Township, in Eastern Ontario to fight a proposed mega-landfill. The Dump Site would be situated on pristine land which is the headwaters for at least four streams and contains a 32-acre quarry lake on the highest land in the area. The hill has a very high water table and it would be just a matter of time before leachate from the proposed landfill, leachate pond and contaminated soil stockpiles would pollute the streams. Also as soon as work is done up there the drainage would change and have negative downstream impacts immediately. One of the streams flows into the Bearbrook and the rest flow into the Castor, tributary of the South Nation, tributary of the Ottawa. Surface water in this area is already suffering from too many nutrients caused in part by livestock and in part by rapid residential development–a landfill on such a sensitive site would add a toxic load to the Castor which could be deadly to aquatic life. As part of the campaign to preserve healthy Ontario rivers please note that a very valuable, rich and unique habitat containing numerous species-at-risk and holding the headwaters of several streams is at serious risk. This place is in Russell Township just outside the city of Ottawa in and around a former shale quarry, which is now a lake. Streams and springs rise up on the hill around the lake and drain into the Castor River, which drains into the South Nation and then the Ottawa. Species at Risk at the site include Bobolinks, Cooper’s Hawks, 10 species of amphibians (some at risk and some less so, although all amphibians have survival problems now), snapping and probably other turtles, Eastern Meadowlarks, Butternuts, rare Liverworts, several Mollusc species (snails), trees of increasing rarity, Orchids, and mosses, lichens and fungi. It is an important migration stopover point–at times hosting tens of thousands of birds at once.